Want to easily whip your tummy into shape? Try this at home flat stomach workout for women to get a slim, toned and trim belly, and sculpt your abs in no time! Start this core workout with a 10 minute warm up circuit. 1. Knee hugs: 45 seconds. Sit down with your knees bent, your hands hugging your knees and lift your feet off the floor. Open your arms, extend your legs to a 45-degree angle and lean back. Lift your torso, bend your knees and return to the starting position. 2. Inverted v plank: 60 seconds. Start in a low plank position, press down through your shoulders and arms, and lift the hips toward the ceiling. Slowly return to the starting position and repeat for 60 seconds. 3. Standing side bend: 45 seconds. Stand up, holding a dumbbell with both hands, and raise your arms up and above your head. Bend your torso to the right, as far as it feels comfortable, pause, and then bend it to the left. 4. Sprinter crunch: 60 seconds. Lie on your back with your legs fully extended and your arms bent and by your sides. Lift your torso off the floor, bend your right leg, and bring your right knee close to your left elbow. Switch sides and repeat. 5. Plank jacks: 45 seconds. Start in a push-up position with your feet together. Hop your feet as far as you can and land softly on your toes. Hop again and bring your feet together. 6. Pilates swimming: 45 seconds. Lie on your belly with your arms and legs fully extended. Raise both arms and legs off the mat, lift your head and chest, and flutter your arms and legs for 45 seconds. 7. Mountain climbers: 60 seconds. Bring one knee toward the center of your stomach and then quickly alternate between legs. 8. Dead bug: 60 seconds. Lie on your back, extend your arms and legs toward the ceiling. Lower your right leg and extend your left arm behind your head. Switch sides and repeat. 9. Waist slimmer squat: 30 seconds + 30 seconds. Stand straight, holding a dumbbell with both hands, rotate your torso to the right, straighten your arms and raise the dumbbell until it’s parallel to the floor. Squat, as you rotate your torso to the left, and bring the dumbbell diagonally across the body until it’s close to your left hip. Repeat for 30 seconds and then switch sides. 10. Side plank: 30 seconds + 30 seconds. Lie on your side with your body fully extended. Lift your body off the mat and balance your weight between the forearm and the side of the foot. Keep your body in a straight line and hold for 30 seconds. Change sides and repeat. 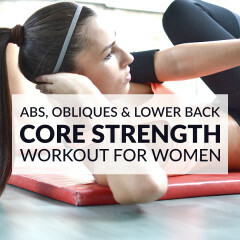 Stretch your abs, obliques and lower back, and finish this flat stomach workout with a core stretching routine. Whip your tummy into shape with this at home flat stomach workout for women!